The Greater Bragg Creek Trails Association in partnership with Alberta Parks (Kananaskis Country) held an open house on a Draft All Season Plan for the West Bragg Creek Trail System last night. About 60 people showed up. Use the comment form to provide feedback by December 18th. West Bragg Creek is a popular Kananaskis Country trailhead close to Calgary. There are 43 km of existing loop trails for “tracked” cross country skiing in this foothills setting but there are growing numbers of skate skiers, snowshoers as well as winter hikers, dog walkers and equestrians. Many of these ski trails use old logging or seismic trails in sheltered areas where snow retention is better in this area of lower snowfall and strong Chinook winds. The ski trails are maintained through a partnership between Alberta Tourism Parks and Recreation (TPR) and the Greater Bragg Creek Trails Association (GBCTA). In summer, there are growing numbers of hikers, mountain bikers and equestrians but few sustainable summer trails. Summer users often find the ski trails to be muddy, occasionally hazardous and lacking in good views. Concerns about the impact of summer trail use on wetlands and streams are increasing in this part of the Elbow River watershed. The GBCTA and the Alberta Government support efforts to maintain or enhance water quality in the Elbow which provides about half of Calgary’s drinking water. This trails plan for West Bragg Creek is sponsored jointly by the GBCTA and TPR through their partnership agreement. Planning funds included a grant to GBCTA from the Shell/Husky Moose Mountain Environmental Enhancement Fund as well as matching funds and contributions in kind from TPR, Kananaskis Country. This draft plan to upgrade and enhance trail opportunities in West Bragg Creek is intended to improve existing recreation while reducing impacts on the Elbow River watershed, area wildlife and conflicts with other land uses. 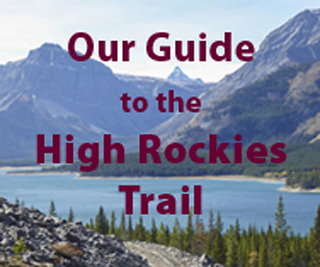 A series of objectives and principles guided plan preparation by a Plan Advisory Committee consisting of trail users, conservation groups, key stakeholders and a planning consultant. They gathered background information, determined user needs, assessed potential trail opportunities and constraints and have made a series of recommendations. Work with SRD biologists to assess impacts/concerns on existing or proposed new trails. Develop several loops from 3 to 25 km on four ridges where drainage and views are good and impacts and conflicts minimal. In addition, several recommendations for improved User Information and Education as well as Plan Implementation and Operations are presented.